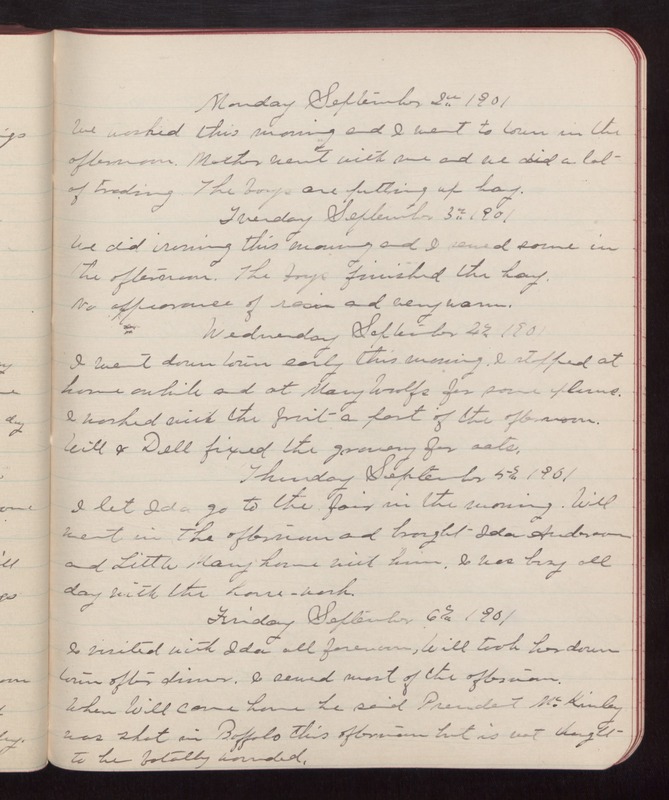 Monday September 2nd 1901 We washed this morning and I went to town in the afternoon. Mother went with me and we did a lot of trading. The boys are putting up hay. Tuesday September 3rd 1901 We did ironing this morning and I sewed some in the afternoon. The boys finished the hay. No appearance of rain and very warm. Wednesday September 4th 1901 I went down town early this morning. I stopped at home awhile and at Mary Woolfs for some plums. I worked with the fruit a part of the afternoon. Will & Dell fixed the granary for oats. Thursday September 5th 1901 I let Ida go to the fair in the morning. Will went in the afternoon and brought Ida Anderson and Little Mary home with him. I was busy all day with the house-work. Friday September 6th 1901 I visited with Ida all forenoon, Will took her down town after dinner. I sewed most of the afternoon. When Will came home he said President McKinley was shot in Buffalo this afternoon but is not thought to be fatally wounded.